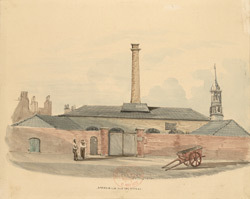 This small gasworks probably stood on the east side of Norway Street in Greenwich between c.1823 and c.1828. The first public supply gas works were developed in London from 1811. Within ten years speculators had appeared who offered to build gas works in towns and communities to be subsidised by finance raised locally through various deals. In Greenwich two such speculators approached the Greenwich Vestry (the local authority) and the resulting row escalated into Government action (a ‘writ of mandamus’) and the downfall of the ruling group in the vestry. The Norway Street works was taken over by a larger company within a year of construction and used while the rival works was rebuilt – the other new works was slipping into Deptford Creek as quickly as it was built. By 1828 the Norway Street works was no longer in use as a gas works and was advertised to rent - described as “a valuable property at Greenwich near the river Ravensbourne with brick buildings and a lofty chimney suitable for an iron foundry or any trade requiring large premises”. It was eventually sold. The rival gas works built by the Phoenix Company in Thames Street was to flourish and did not close until the First World War. By that time gas supply had been taken over by other and larger concerns – in this part of south London it was eventually superseded by George Livesey’s magnificent works on the Greenwich Peninsula.